This disc was auctioned on eBay in August 2005. However, it's been documented for some time. The auction description below offers nothing in the way of valid info (it even includes several inaccuracies. 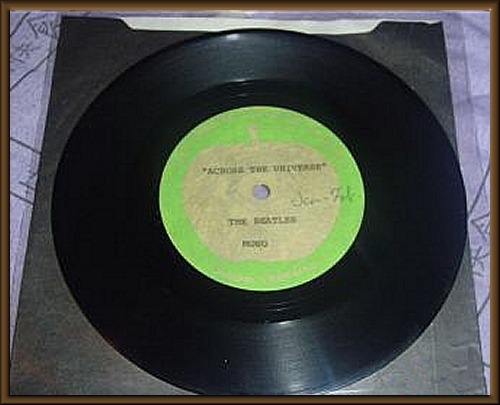 Although I've included this in the 1968 section (because that's when the basic tracks were recorded), it's difficult to discern just when this acetate was cut. 8 February 1968 contains RM1 and RM2. 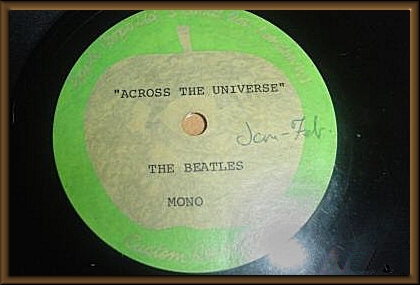 Reel AR 13736 from 13 March contains a mono mix which was intended for an unissued double 7" EP of Yellow Submarine tracks with "Across The Universe" as a bonus. However, there is no indication if it is a new mix or one of the mixes from E67489. The "Jan-Feb." notation on the label further adds to the mystery. With the exceptions of work done for the World Wildlife Fund album in October 1969 and Phil Spector's mixes from March 1970, all work on this song was done in February 1968. On the other hand, an acetate was heard during the Twickenham rehearsals in January 1969 and Glyn Johns did a (stereo) remix in January 1970. First ever recording of this song at the apple studios! This is an *Acetate* recording! It says in The Beatles anthology that the song Across the universe was never going to be released and was just going to be kept as a song The Beatles may release. It comes in a black sleeve with Apple written on the front and back and a clear sleeve protects this. Jan-Feb is hand written on the record I believe this was written by one of the Beatles as this record was given to me by a friend who worked with The Beatles at the Apple studios. This is very rare and this is the only one avaliable!